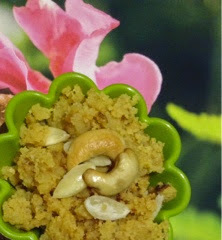 This is an earthy dessert known in every household of Hyderabad but simply taken off the dessert list perhaps, forgotten under the humongous list of desserts we so desire to try out.It is very simple and that could also be another reason for it's having disappeared; paradoxically the very same reason why it is a pleasure to prepare and serve. At my place it is my father in law who makes this seldom, but enough to rake up nostalgic and lingering memories from childhood for my husband and his siblings who missed their dad as he was never around in their growing up years due to working overseas and it was a sort of homecoming when he arrived during their summer vacation once a year and took to whipping up desserts in the kitchen for them to relish.If you are a hyderabadi you wouldn't agree less that this truly takes you back into time. Boil the milk until it is reduced to approximately half it's original quantity and let it cool.Beat the eggs and add it to the milk along with sugar. Now, run the milk and egg mixture in a blender for 3-4 minutes or use a hand blender until it is foamy, add the cardamom and maida and blend once again for a minute.Now return the thoroughly incorporated mixture to a non stick pan and let it cook on a low flame all the while stirring it to avoid burning.Keep adding a teaspoon of ghee at regular intervals while stirring from time to time until all of the ghee is used up.The mixture begins to solidify into a dry mass and the ghee begins to appear on the edges.When it's completely dry and soft,add the flaked and toasted nuts as a garnish and serve hot. 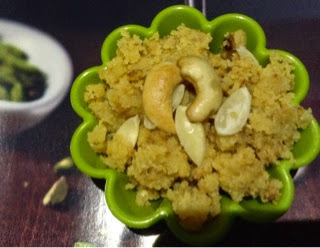 You could also use bread crumbs instead of maida the quantity remains same.This dessert must always be served hot.